Cesar Azpilicueta - One of the Premier League's most complete players. 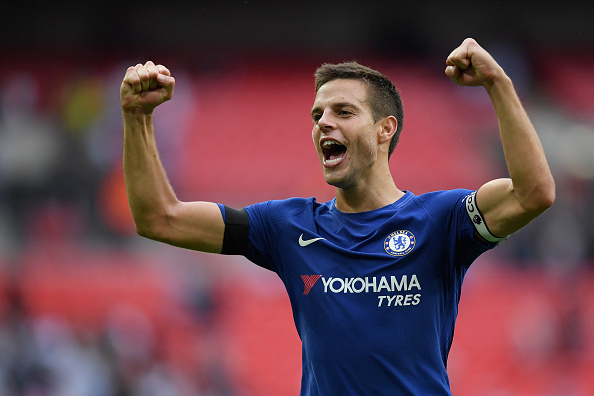 Cesar Azpilicueta has been described as one of the Premier League's most complete players in addition to being labelled the best one-one-one defenders in our game. When Chelsea signed "Dave" for just £7m back in 2012 no-one had any idea of the impact he would have at our football club. Signed as an established right-back from Marseille, it was when Jose Mourinho moved him over to the left-back position in a League Cup game against Arsenal at The Emirates that we realised we had someone special on our hands. Chelsea beat Arsenal that day and Azpi scored running onto a ball over the top to slot past the Goalkeeper. From that moment on, Ashley Cole found it difficult to win his place back into the side as Azpi's performances maintained an excellent standard and Ashley Cole left Chelsea at the end of the season. In our title winning season of three seasons ago, both Gary Neville and Jamie Carragher on SkySports Monday Night Football described him as the best one on one defender in the Premier League as a result and that was playing as a left-back a position that was not his best. Step forward to last season and the tactical switch that led to Chelsea winning the Premier League for the second time in three seasons, Antonio Conte decided to switch to three centre-backs in his team and rather than play as a right wing-back, Conte deployed Cesar Azpilicueta in his third different position at Chelsea since he arrived on the right hand side of those three at the back. It's fair to say that once again Azpi has adapted perfectly to that position, OK at times there is a worry that he could be beaten in the air if caught out at the back post (Tottenham away) but thankfully, there has been little evidence of that happening again. "In the days when Azpilicueta was playing left-back for Chelsea, I distinctly remember him running into some great positions, looking for the ball and actively being ignored by some of his Chelsea team-mates. Given the fact that, at the time, Chelsea had some wonderful ball-players and creative technicians in their team, I did have some sympathy with their decision-making. However, since those early days at the Bridge, Azpilicueta has grown into one of the most complete players in the Premier League. The defender [Azpilicueta] still makes himself available. The only difference is that no-one in the Chelsea team would dare ignore him now. His pass for Alvaro Morata to score Chelsea's second against Everton on Sunday was absolutely exquisite and typifies the way the defender has developed his game in open play. He has done it before and I have no doubt he will do it again." - Article Source: London Evening Standard. In the big teams it's easy to focus on the mega stars that score and create goals. However, as I have said so many times, you need to have the right balance in your team if you are to be successful. If you are to challenge for the Premier League and for the major trophies you need to have a solid defence and players that are consistent throughout the season. Cesar Azpilicueta has proven from the day he arrived at Chelsea that he is exactly that and one of the most complete players in our game. So far at Chelsea, Azpi has won 2x Premier League titles, the Europa League and the League Cup. Would would bet against him and Chelsea adding to his trophy haul? Check out the odds of him doing that this season at Soccer betting NZ.